It has now been enough time for me to feel well adjusted enough to start more on this whole blog thing. My Pre-K Explorers and my Friday Storytimes have been going well. In our department we all sign up for weeks to plan a theme around. For my Pre-K explorers I adapt the theme for a little older age group, (harder books, more complicated crafts, and group games/activities). In additon to adapating the theme we are also concentrating on a different letter each week, this usually includes having a tracing sheet for them to practice writing that letter. The theme this past week was Silly Monsters. We had scores upon scores of great books to read so I did not have to worry about that. They loved growling and howling along to some of the books that called for participation. For our group activity we all made a monster together! The week before I cut out pieces for different eyes, mouths, noses, eyebrows, and ears. 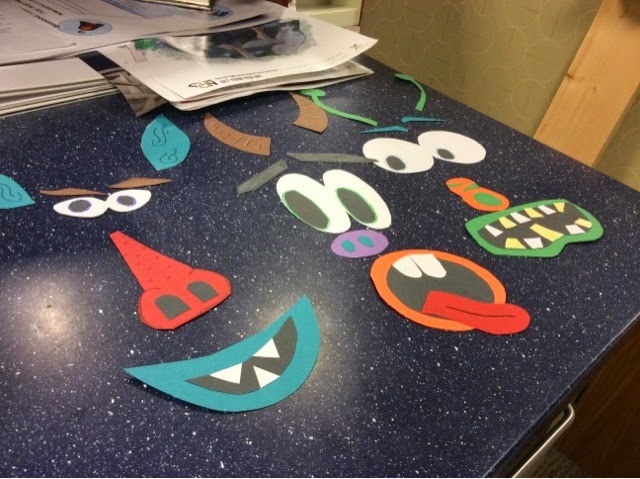 Each child got to pick out of three choices for each feature and stuck them on a monster on the wall that I made. (I totally forgot to take a picture of the blank monster). Planning three school age programs for January-March. Minecraft in Real Life, Candy Science and a Big Nate program! I also have two large piles of penguin picture books on my desk because my week to plan a theme is December 1-5 and we are doing PENGUINS! I am also contemplating having labels or small signs that stick out put on our bookshelves where are most frequently asked books and series are. These include, Lego, Minecraft, Star Wars, Junie B. Jones, Magic Treehouse, etc. I'm doing a bit of research into surveys that parents could do on our deparment iPads after storytimes and programs so we can start collecting more data than just how many people show up. Whooo! Trying to put the pedal to the metal! This is my second Young Hoosier Book Award nominee review. I have picked a few from the Intermediate and Middle Grade lists to read. This book is about twelve year old Sarah, who among other things she is doing in this novel is also writing letters to her literary hero, Atticus Finch. I find this to be especially interesting to read AFTER I just finished Go Set A Watchman. Although I'm sure Karen Harrington had no idea that GSAW existed or was going to be published during her work on this book I would love to know her thoughts on Lee's "new" novel and how it relates to her character Sarah in Sure Signs of Crazy. Like Sarah, and many of us I'm sure Ms. Harrington was probably also a big fan of Atticus in To Kill a MockingBird. This was our second attempt at this program. I originally found this idea over at the tweenlibrarian.blogspot.com and tried it our back in February of this year. The only problem? Nobody showed up. The winter months have historically been hard for us to get school-agers in the door for programs. My co-worker decided to redo the program this month. I did not know if I would be here to help or not because we are on baby watch, but fortunately I was able to see the program actually happen! We had 30 people show up and even though it was self-directed, most stayed the entire hour! This program was setup as stations and kids and parents could to go to as many or as few as they wanted, whatever really piqued their interest. Each station was themed around one of the books from the I Survived series and we pulled related titles to have available for check out. I Survived the Sinking of the Titanic. While perusing the Storytime Underground Facebook page eons ago I came across an amazing messy sensory playtime program for little ones. Inspired by Miss Marissa at La La Librariana blog I created our Messy Mozarts program for this year's Summer Reading program. This program was for ages 0-3 and required registration. This was mainly because we are using a meeting room for a program room and thus required the entire room to be covered in tarps! Bless the hearts of our facilities staff who let me do this. All activities were appropriate for children under 3 and if they included food I listed allergens on the signs. While the kids played and got messy, I play some classic Mozart music! Rainbow Fluff Pool: I bought an inflatable kiddie pool on Amazon, filled it with pulled cotton balls and scarves and let the kiddos go wild!